15 Inch Wicker Baseboard Register - Antique Brass Discounts Apply ! Use baseboard air registers in both commercial and residential locations. 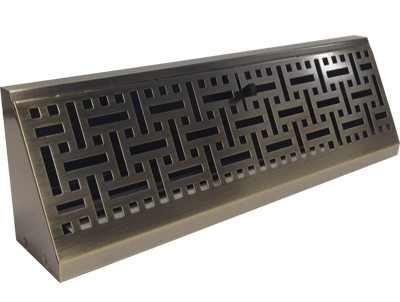 These decorative vents are made of durable stamped steel. The baseboard air registers are finished with an antique brass plating and protective clear lacquer coating. Not only are the decorative vents durable, they are also functional. They come with an adjustable air damper to regulate air flow. Another great feature of the baseboard air registers is the removable face plate. This means that the decorative vent will be easy to install and maintain. Find baseboard air registers in more sizes and styles. Installing decorative vents along your baseboard is a fast and easy way to improve the look of your home. Order today!